The Premium Family is growing! We have more and more Premium moments to remember together. We introduce the Premium Family. We started with the Alcazaba Premium Hostel, the first member of our wonderful family, perfect for holidays in Malaga. Now we are taking another step with another designer accommodation offer, full of charm and with innovative gastronomic offers. Alcazaba Premium Hostel was born as a designer boutique hostel, also located in the centre of Malaga and aimed both for couples and for families or groups of friends, as the rooms can be adapted to receive up to ten people. This has become a reference point in the centre of Malaga, especially for its innovative Batik Restaurant and La Terraza de la Alcazaba, with unbeatable views of the Alcazaba and the Roman Theatre. 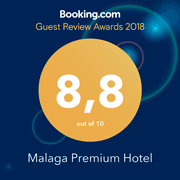 After that came Malaga Premium Hotel, a Superior 3 star boutique hotel specialising as a gastro-hotel, and aimed at visitors who come to Malaga for business, or who are on holiday in Malaga with their partner or family. It offers two restaurants, each with its own concept and décor. And don’t forget the great attraction of the location of the hotel in the centre of Malaga: the chill out terrace, La Terraza de San Juan, offers wonderful views over the city.